Getting ready to take a vacation is a lot of hard work. I will be leaving for a nine day trip to Colorado soon (sorry burglars, but my house will not be vacant, I have a house sitter) and the preparation before and after a trip is a lot of work and almost requires another vacation from my vacation! One of the things on my "Must Do Before I Leave List", is to make my May Christmas Cards. As most of you already know, I play the Splitcoaststampers Christmas Card Challenge where we make Christmas Cards all year long so that were not stressed out during the busy Holiday Season. I make five cards a month so I will have about sixty cards at the end of the year. I make a long card, 4 x 8, so I can put a Christmas Letter and Photo Collage inside. I had three of this image already printed, so I did three of this same card. All the paper is from the same DCWV Christmas Stack. I cut the banners with an MFT Die, and inked the edges of the blue banner with a marker to make it stand out more. I put Liquid Applique on all the hats, and added two different types of ribbon for embellishment. 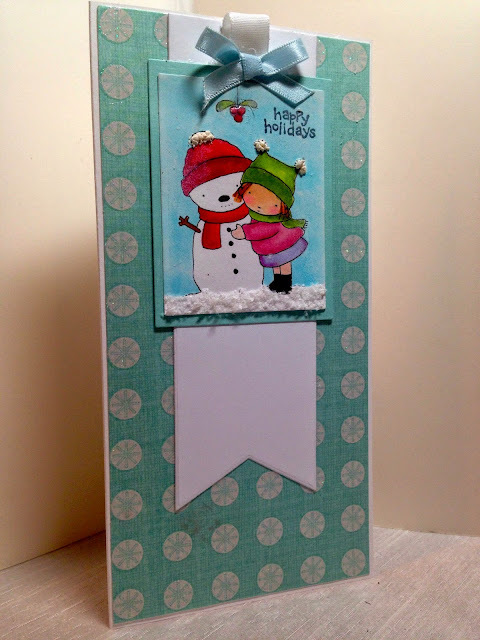 Flower soft was used to create all the snow in all the cards. The sentiments are all retired Stampin Up!. 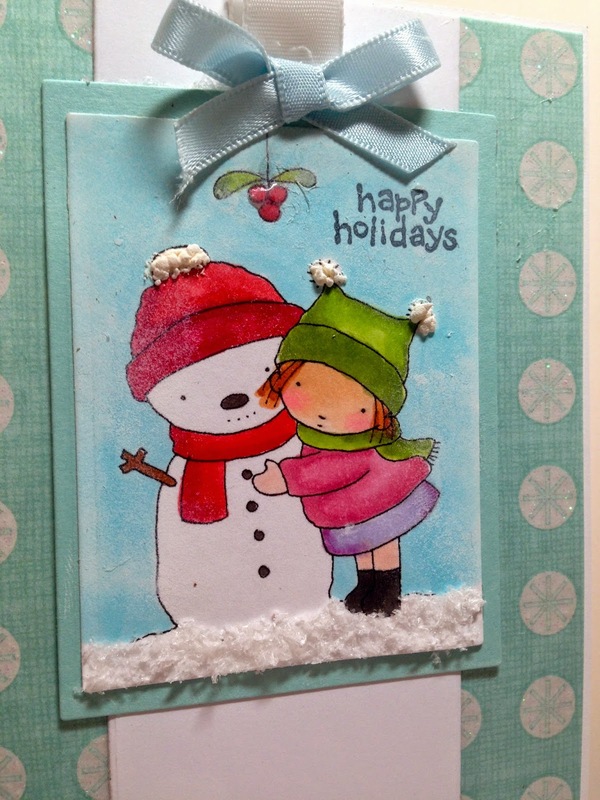 I put Crystal Effects on the berries in this card, and because the blue sky I colored in seemed to clash with the blue in the papers, I sponged some white ink over it. 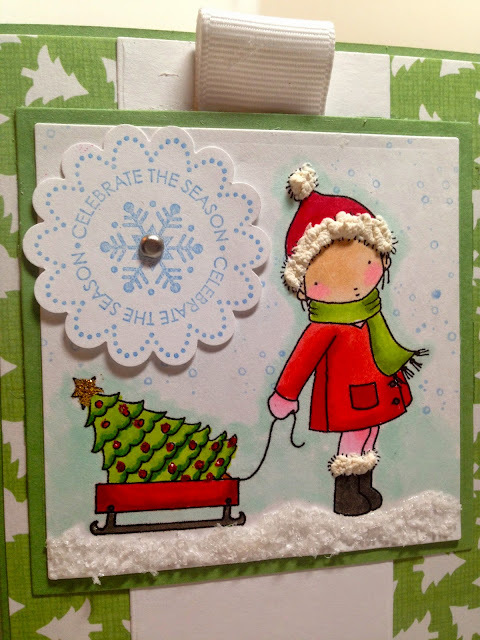 For my last style of card, I added a different retired Stampin Up! 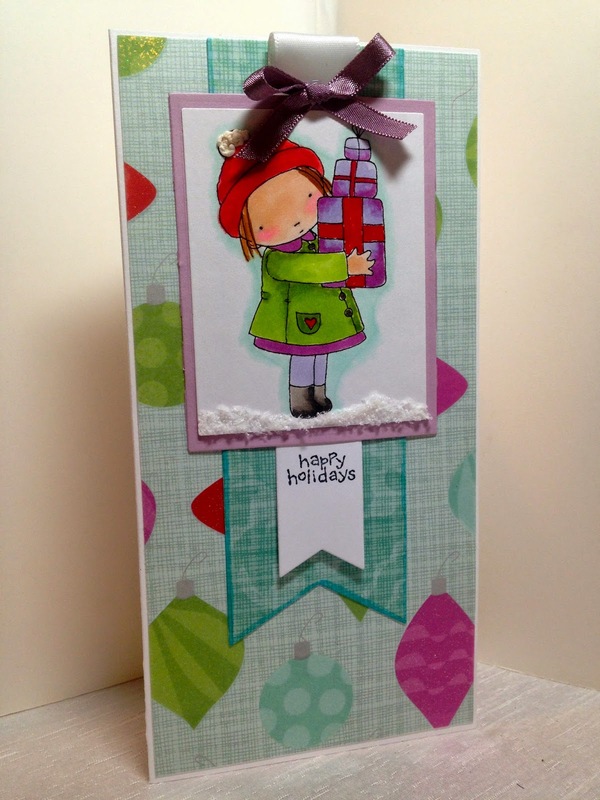 sentiment and cut it out with a coordinating Stampin Up! punch. I attached it to the image panel with a brad. I put red and gold Stickles on the Christmas Tree. 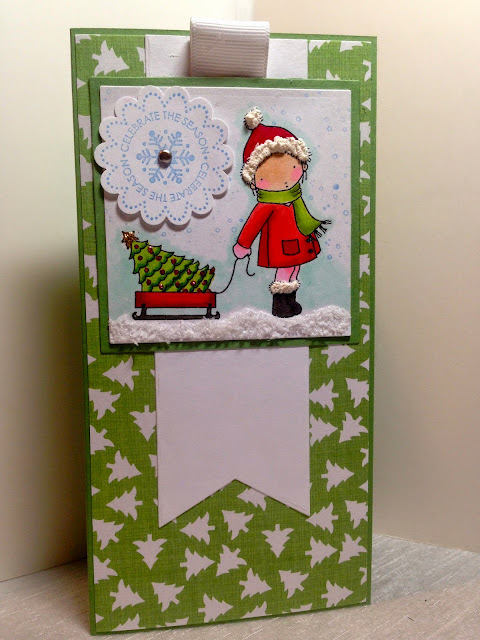 I stamped some extra snow in the background using a retired Stampin Up! stamp and Bashful Blue ink. I'm not sure how often I'll post next week, if I even post at all. When were on vacation, my husband and I like to leave the cares of this world behind us and just focus on each other, so if you don't hear from me for awhile, don't worry, "I'll Be Back!". These are so cute! Love the images and great papers! Can't wait to read about your Colorado trip! I hope you have a great time on your trip! Love the cards and that you're staying on top of things! LOVE these cards Amy - love the papers and the snow across the bottom - and beautiful colouring of the images. Oh, and I meant to say: have a fantastic holiday too. 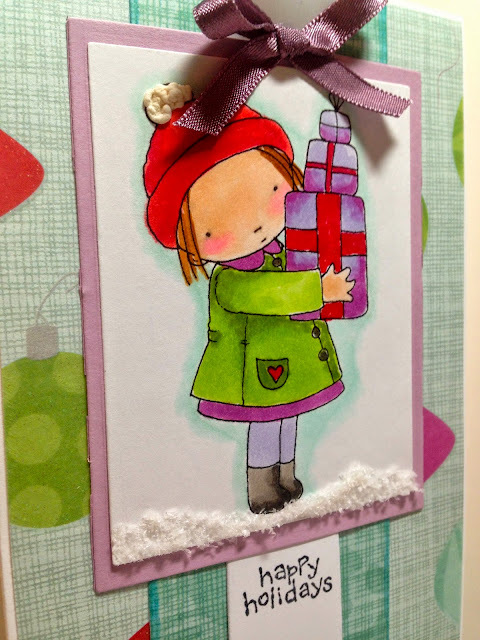 Oh fabulous cards AMy, so nice images, papers etc... !